Today you’re going to hear 8 tricky questions that a British English speaker might ask you. Also check out 7 Things British English Speakers Say That Your Teacher Told You Not To. Sometimes British people can be really difficult to understand, right? In my experience, most English learners tend to prefer British English but find American English easier to understand. Until now! Because here I am revealing the secrets of “deep English”! You can thank me later. With cake! Before you read the post, have a listen to these 8 British English questions. Can you work any of them out (guess the meaning)? Don’t worry if you can’t, we’re going to look at them later. 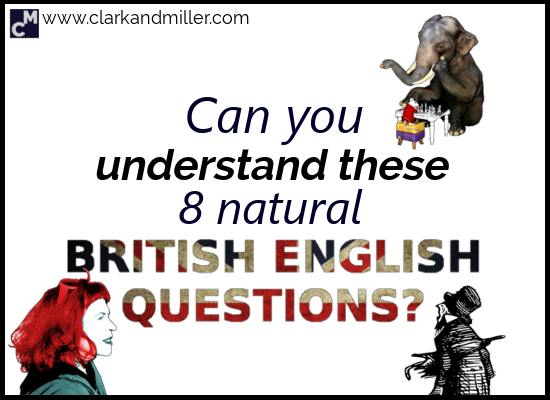 So here we go: can you understand these 8 natural British English questions? = What are you on about? Can I use this question with my boss? This is both very informal and quite direct. (Notice that we even drop the word “are” in the question.) It’s best to use this with friends or people you feel relaxed with. Let’s imagine your friend has been telling you a story about his excellent evening with Terry the Giraffe. He’ been talking for ages, but somehow he isn’t making any sense. One minute he’s describing being in a park with Terry, and the next minute they’re on a plane to Sri Lanka. Then Terry isn’t a giraffe but a large mouse. = What are you up to? I don’t know why, either. Like most of the questions in today’s post, this is rather informal. So unless you work in an extremely relaxed atmosphere, it would be good to avoid asking this question to your boss. However, you’re probably fine using it with colleagues. By the way, you can also use the phrase “get up to” in the question “What did you get up to last weekend?” — a perfect Monday morning question. It’s not totally formal, but most places I’ve worked would consider it fine. Just use it when you want to ask if Karl is nearby. But if you’re not looking for Karl, then don’t use it. Just kidding — you can change the name if you like. = Where are you off to? This one’s a little informal, so probably not with your boss, but it’s fine with your colleagues. Just go for this one if you want to say “Where are you going?” It’s that simple! Again, this is rather informal, so if you work in a formal environment, don’t use this at work. Use this when you want to ask about someone who’s behaving either strangely or differently from normal. For example, you work with Sam. Sam’s a great guy. He’s always in a good mood — or at worst, he’s just polite. Then you go to work one day, say “hi” to Sam, and he completely ignores you. You see him again later and he shouts, “GO AWAY!” in your face. Sam’s being weird. He’s behaving differently from normal. Sam can’t hear you. This is important. It’s actually pretty rude to ask about Sam’s weird behaviour when he’s around (nearby). This is a “third-person” situation. = Do you want to come over? This one also has a very simple meaning. Yep. But only if you want your boss to visit you, of course. Be careful what you wish for, that’s all I’m saying. Instead of saying, “Do you want to come to my home?” which sounds really unnatural, say, “Wanna come over?” — much more natural! Although this is usually used for home visits, you can also use it if you’re asking someone to your workplace or even someone else’s home. Just make sure the other person knows where you are, or things could get messy. = Are you having a go at me? OK. This one can be a little aggressive, but among friends, it can also just be a bit of fun — you know, in that way that some people like to form social relationships by calling each other names and punching each other in the shoulder. Not my style, but some people seem to like it. This is probably the most confrontational phrase on the list. But I’m including it because people use it all the time. Just remember, it’s all about the way you say it and who you say it with. If you use it in a light voice (check the audio above) and with friends, it can actually be quite fun. Let’s say you’ve just dyed your hair. It was brown, but you’ve gone for an awesome shocking red. Good work by the way; it looks fantastic. Now, you know that your friend isn’t talking about you. She probably just forgot that you’ve dyed your hair. In fact, this is the only question from today’s post that you can use with your boss, even if you work in a formal environment. This one is business friendly! You know those kinds of meetings. You’ve all discussed everything you need to discuss. You’ve all asked questions about the things you’re not sure about, and those questions have been answered. But there’s always that guy. You know the one — the guy who loves to talk. And he’s still asking questions. The same questions. Again and again and again… just in a different way. This is a sure sign that the meeting is finished, right? It’s a great way to finish things up without being too sudden and final. You can also use this in any situation when you’re working on something with someone, and it’s reached its natural end. Hopefully, the next time some British guy approaches you making strange sounds from his mouth, he might actually be asking one of these questions, and, hopefully, you’ll be able to answer him! Have you noticed any other weird things that British people say? Tell me in the comments. It’s great to share the knowledge! Also, if you enjoyed this post, please be awesome and share it. Let’s make British English easier to understand for everyone! Thank you very much! This is a very useful topic! Thanks Elena. I’m glad you found it useful! These are brilliant Gabriel. My students really struggle with “What are you up to?”, especially when I pronounce it as “wotcha”. It’s kind of the intersection of informal pronunciation “wotcha” and informal language “be up to something”. Love it. Do you remember as a kid when your friends would come round to your house, knock on the door and ask your mum (or whoever opened the door) “is Cara coming out?”, meaning “is Cara coming out to play”? Or hang out in the street and get up to (there’s that expression again!) no good. I used to have a French English teaching colleague who would conclude meetings by translating “shall we call it a day?” into literal French “On appel ça un jour?”. He thought it was hilarious. French humour eh? Yeah — I remember the “Can Gabriel come out?” And there were certainly times when we got up to no good. I’d say “boys will be boys,” but it wasn’t just the boys, was it? I love the literal translation into French. Sounds so funny! He’s right to find it hilarious! Haha. Being introverted (but not understanding what that was back then) I probably couldn’t be bothered to “come out” a lot of the time. Once I was home, I just wanted to shut myself away with books, TV or making stuff. Yeah, I was being a bit disparaging but “on appel ça un jour” is pretty funny. “Are you passing waves at me?”. I like it! “Are you taking the mick?” is another one to add to this list surely? Yeah — I missed out “taking the mick.” Perhaps for a part two. I’m sure there are more of these lying around in various Brits’ lexicons! Thank you, Gabriel, I’ve put down the phrases, it was very interesting to get to know them all. Till then! Good work! I’m glad they were useful to you and you enjoyed the process of learning them! Cheers! Thanks Nancy — I’m glad you liked it!